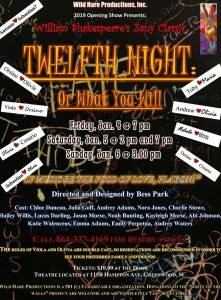 Past Events – Wild Hare Productions, Inc.
Wild Hare Productions is presenting William Shakespeare's comedy featuring mistaken identities, joyous reunions, love and romance, clever disguises and believe it or not, so much more: TWELFTH NIGHT: OR WHAT YOU WILL. "Women on Fire" and Chris "Israel" Allen's new script, "The Book of Judges". 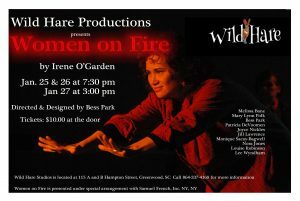 Irene O’Garden's critically acclaimed play, "Women on Fire" features a dozen compelling monologues voiced by a diverse range of different female characters who are faced with a myriad of personal and professional challenges. Cast list is included on attached poster. THE BOOK OF JUDGES opens Friday March 8-10 at Wild Hare Studios Theatre. Join us for this powerful original one act by Israel Allen, directed by Monique Sacay-Bagwell, which explores the ethical considerations surrounding questions of truth and justice. Wild Hare Productions, Inc., is a non-profit 501 3 (c) charitable organization. Wild Hare is a company committed to producing and presenting innovative theatre/dance performance and training. Please ask how you can help support us with a tax deductible donation!